In the not so distant past, the green and sustainable lifestyle movement was notably a left wing religion. But now it has become a real mainstream concept. As such, it has changed new construction as well as residential and commercial remodeling. Technology and building materials and processes have evolved and become mu8ch more practical because the return on investment (ROI) is there. But now thats changing in a big way. More and more architects and building contractors understand the value and see it as a tool to drive more business and revenue. Plus, it had become a case of if you cant beat em, join em. They are responding to consumer demand. Real estate buyers as well as owners are seeing the benefit of making the initial investment in green equity. Earthadvantage.org tells us that there are some interesting trends emerging. Lets take a look at some of the most important ones. A tight envelope simply means that not only is the home well-insulated, but further, as many drafts as possible have been sealed. New homes are being built this way but older ones may be retrofitted. What is the best way to approach a retrofit? Contract with an energy auditor contractor. They have specific tests they can perform, such as an air infiltration rate test. Also, a thermography using an infrared scanner is helpful. The sustainable and the energy-efficient building material industry is maturing. This now makes it increasingly possible to assimilate more accurate and informative metrics. This data is informing the industry as to what really works in the long term and things dont. The resulting information works to stimulate ongoing innovation. Folks, this is our free enterprise capitalist system at its very best. Lets take home insulation as an example. We have come a long way from just stuffing our outside walls with fiberglass. Believe it or not, there is the interesting development of spray foam insulation made out of soy beans. Yes, it sounds very odd, but it has proven to be very effective, being energy-efficient, relatively inexpensive (easy crop to grow), and it is inert so it doesnt promote either mold or insects. Many municipalities suffer from serious water availability concerns. Two popular techniques that help this concern are rainwater harvesting as well using gray water. Ideal uses are watering the lawn and irrigating. The harvesting of rainwater is simply collecting rain running down the slope of your roof and storing it in barrel or a cistern. One of the advantages of rainwater is that it is much better for your lawn and raised bed vegetable gardenraised bed vegetable garden because the PH is better for plants than tap water. Gray water is defined as all used water from the home except, of course, for the raw sewage from the toilet. By reusing it instead of just routing it down the sewer will drastically lower potable water use and mitigates the strain somewhat on municipal water treatment plants. Whenever replacing an existing appliance or purchasing one for a newly constructed house, you have two simple choices—buy a conventional (cheaper) model or one that is dressed up with the Energy Star label. Energy Star is clearly the superior choice. Of course the price tag will sting a bit more, but on top of saving money on utility bills, in many cases you will be able to claim an energy tax credit when you file your federal income tax. 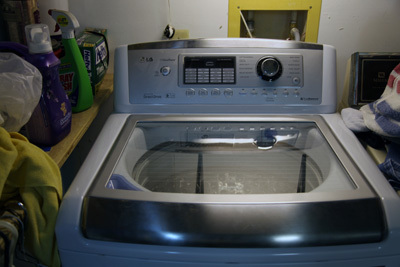 The LG WT5001CW high efficiency large capacity washing machine pictured at the top of this article is a good example. Not only does it use less electricity, but it senses the size of the load and adjusts the volume of water accordingly. Just exactly are grid-aware appliances? At this point it is a fuzzy concept. But the idea is that the appliance has the capability monitor its own energy usage and can either self-adjust or simply report details. © 2012 Kelly Smith All rights reserved.